Interior door handle in stainless steel Hoppe Paris series on round rose and yale keyhole. With long handle version. The Paris handle is an unusual handle with a handgrip of well 181 mm in length. Used in production environments, schools and administrative buildings for comfortable and eye-catching handle. 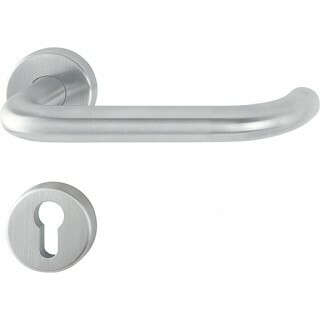 The whole structure of this handle was made of stainless steel for an average duration very high. Finishing with F69-S acronym means that the surface is protected by a repellent antibacterial layer (Secusan). Grouping together in a single solution, hygiene and functionality.